Vacation rental house. Sleeps 8, 3 bedrooms, 2 bathrooms. No pets allowed. Patio right out the door with great ocean views! Beautiful privacy partition between second room and dining room. Pathway from parking to your suite! Long lawn to Suite 2! Strenuous path to rocky landing. Subject to weather, tide, and physical ability. Path is steep. Large 3-bedroom apartment with 1 King, 1 Queen and 1 Double, living room with futon sleeper sofa and large stone fireplace and dining area, including expansive yard directly above the Pacific. Access to beach below is down a private, long stairway, for athletic people only, as last steps are straight down to wild, rocky landing (tide dependent). Kitchen is cozy, yet has sink, stove and oven. There is also a shared BBQ outside. This rental is Suite 2 with the Suite 1 next door. Both on the ground floor. There is another rental upstairs, and both may be occupied during your stay, so there is the potential for encounters with other guests. Yard and BBQ are shared/common areas. Parking is on gravel and there is a set of natural steps to the residence from parking that may be difficult for some, especially those with any physical limitations. Not wheelchair accessible. Enjoy the beautiful setting, both inside and out, the upscale furnishings, also plenty of outdoor seating and BBQ as well as plenty of comfy chairs to move around to sit and watch the ocean & rocks below from many spots. Great place for watching the migrating whales, too, and the local fishing boats heading out for their daily catch. For those that are abalone divers, please let us know that that you are interested, and you will have an opportunity to speak to owner about details regarding equipment and availability. This beautiful property is located on the exclusive Patrick's Point Drive area which is about two miles north of the village of Trinidad, and 3 miles south of Patrick's Point State Park. Please note, this is a downstairs unit in a triplex style unit. You may hear people and noises from upstairs, as well as see and hear other guests in the common/shared area. My husband and I enjoyed the beautiful views, relaxing, peaceful location. The observation deck is breathtaking. Our hosts greeted us like long lost friends. Anything we needed they helped with! Their recommendation for meals, visit, and explore where all amazing. We have been over to this area many times and DID NOT know about a few gems! We will be back and bring the family!! 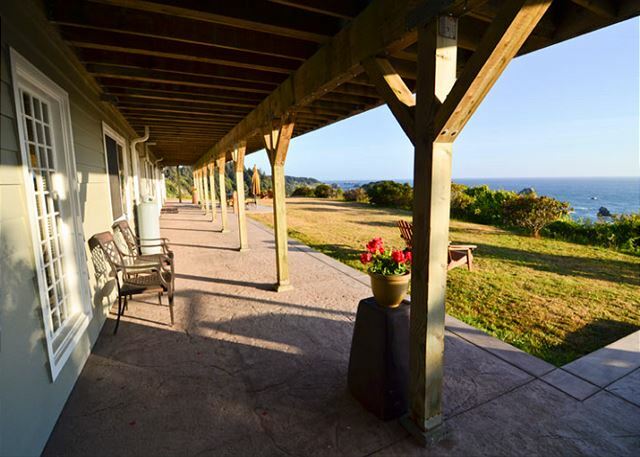 What a wonderful review of the Ocean Views Residence @ Whale Rock. Thank you for choosing this Suite and for booking with Redwood Coast Vacation Rentals. I hope you do look us up again the next time you visit the north coast. Overall, we had a nice experience at the property. We loved the view and proximity to Larrupin (great food!) and Trinidad. Wifi was good and having lots of indoor and outdoor space was great - particularly since we enjoyed some unseasonably nice sunny days on our visit. The kitchen is rather limited in size but we had what we needed for coffee, breakfast and grilling (on the patio) one of the nights we were there. The interior space was expansive but it would have been nice to have a larger bathroom given the overall size of the unit. Highly recommend checking out Patrick's Point State Park, Trinidad State Beach, Moonstone Beach. For food, we enjoyed Larrupin and Moonstone Grill for dinner, Seascape for breakfast/brunch and Beachcomber Café for coffee/breakfast and baked goods. Thank you for taking the time to write a review of the Ocean Views Residence @ Whale Rock, and for sharing that you had a nice experience at the property. We have over 100 rental homes at Redwood Coast Vacation Rentals, so please look us up again if returning to the Trinidad area. We would be happy to accommodate you again. We stayed here for a second time this year. The view is the reason we come but the large unit and comfortable furniture keep us coming back. Thank you for being a return guest. Happy to hear the furniture is comfortable and the view is enjoyed. We do struggle in the fall with spider webs and sorry to hear there were too many. We will definitely focus harder to keep them out. As for noise, any time noise is unreasonable, please tell us right away. We care greatly for our guests stay and have no problem notifying other tenants to walk quieter and be more respectful. There is a whole set of pots and pans above the stove. A quick call and we could have directed you. The seating is just four, as this home is meant primarily for 4 people, as there are only two beds, sleeping two per room. The additional is meant in the event of up to two additional children, and there is additional seating in the kitchen looking out the windows. All being shown in photographs, so no surprises upon arrival. We do appreciate your being a return guest, and for booking with Redwood Coast Vacation Rentals. We do have many other homes in the area, and some with different gorgeous views, as well. The view from the apartment is truly amazing. Exactly as what you see in the pictures. Unfortunately the walls are very thin and you can hear a lot from the upstairs and next door neighbors. Some of tge furniture & walls are in not so great condition & one wall plug was not covered, which was concerning for us with a toddler. Bed was comfortable and hearing the ocean was very peaceful. The Ocean Views Residence is a great place to stay with such an amazing view. It is quite spacious and comfortable. In a tri-plex environment with shared walls, noises can be heard, and as such we have disclosed that in the listing. While most of the time guests do not hear each other, it does happen. I am unable to say after-the-fact, if the sounds heard were unreasonable, but a quick call to us and we could have contacted either neighbor to ask them to be gentler and conscientious of neighbors. So if you stay with us again, please reach out to us. Everyone's comfort is important to us. Again, thank you for your recent stay and we do hope you will return to visit us again. PS, thank you for letting us know about the outlet. Located high on the cliffs above a beautiful view of the ocean. Steep steps to get there from the parking area. Will definitely go back again. Thank you for your review. We can't wait to have you back again and hope you can get some more fishing in! Absolutely stunning location, quite large suite, everything you needed but very thin walls. Happy birthday! What a wonderful home to spend a special occasion such as a birthday. It is quite spacious and the views are wonderful. Unfortunately, the walls are thin, but I do hope that did not spoil your time to our beautiful area. Thank you for your recent stay and hope you will return to visit us again for many birthdays to come. It was perfect place to escape and recover. Even with the full house I felt it was pretty private. Our kitchen had a lot of missing pieces but the owner came over and helped up restock fast. She was kind and helpful. The only downside was they didn’t have a washer and dryer but they had a laundry mat close by. I would recommend to anyone. Note for owner: the binder was a little out of date. The massage prices have changed. 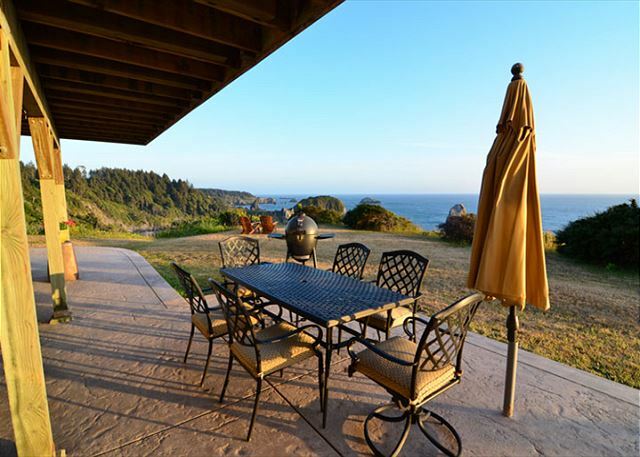 The Ocean Views Residence @ Whale Rock is an amazing place for a getaway. While these suites are ideal for those who like to dine out, the owner is very accommodating at providing an items that may be of need. Thank you for the feedback on the binder. I will contact the Spa for updated information from them, as they provide that for us, and should keep us updated. Thank you for sharing that residence was a perfect place to escape and recover. We hope you will return to visit us again. Pros Amazing view. Comfortable beds and furniture. Spacious living space. Great location. Cons- small shower and no bathtub. Not enough cooking supplies!! No pots or baking dish. Thank you for renting the Ocean Views Residence @ Whale Rock. I also thank you for sharing the pros and cons, as it does help us. The home is very spacious and comfortable. and the kitchen is very limited due to lack of space, although enough is there for basic cooking. A quick call to us and we would have made arrangements to provide some other items for you to use during your stay. We will also see if we can fit a few more cooking items in the house. We do hope you will make it back to stay with us again. We were very happy with our accommodation overall at Whale Rock #2. We were pleasantly surprised to find the oven after not expecting one. All communication was timely and professional from RCVR. The only thing we would change is the mattress in the master bedroom, it could use to be replaced. Thanks for the nice few days in one of the most beautiful parts of the world! Thank you for the review of the Ocean Views Residence @ Whale Rock. The oven is newly installed, and we had just added it to the listing. Thank you for the recommendation on the master bed mattress, we will look into it right away. Trinidad is such a beautiful and scenic place; I am so happy to hear that you had a nice stay and we hope you will return to visit us again. I can't fault the location, the views were stunning. The property itself was beautiful. The kitchen was lacking. It offered a plug in hotplate and had no dishwasher. A small stove and dishwasher would have made a huge difference. We stayed 2 days and loved it but for more than that we would also need to be able to wash a few clothes and towels. Perhaps a small washer and dryer as well. The rest of the place, bathrooms, bedrooms living area and patio were perfect. Beautiful, stunning views, Trinidad and surrounding areas are well worth a visit. Thank you for taking the time to review the Ocean Views Residence @ Whale Rock. The suite has a gorgeous view and it is just a short drive to town and to many scenic sights in and around Trinidad. Sorry to hear if there was any confusion about what the kitchen may be lacking, but the listing does state "there is just a kitchenette inside with one burner hot plate and counter top convection oven". In addition, the home is not advertised as not having a washer & dryer, so guests will have this information prior to booking. I am glad to hear that you did enjoy the place otherwise, and we do hope you will visit us again, here in Trinidad. Thank you for booking with Redwood Coast Vacation Rentals. Our experience at Whale Rock was amazing. The views and the property are exactly as advertised. The location is perfect to get to and from all the parks and towns in the area. The accomodations were nice as well. Very clean and despite ot a full kitche (which we knew going in) it had everything we needed. Thanks for the great review! Hope we can host again with Redwood Coast Vacation Rentals in any of our 100+ available vacation homes! The place was great view was incredible. Was disappointed the stair case to the ocean was washed out because that was the top reason for renting this property. But it was still a great reason to rent the property, you felt like you were on a deserted island could so nobody.The unit was very nice and clean. Had plenty of room to spread out during a 2 week vacation. Sunsets were awesome and in the morning the fog was cool. What a view, huh? So glad to hear that you enjoyed your time here. We had so much rain this year that many of our bluffs have washed away, so sorry about that, but the view and location is quite nice. And not too far from other scenic beaches to visit. 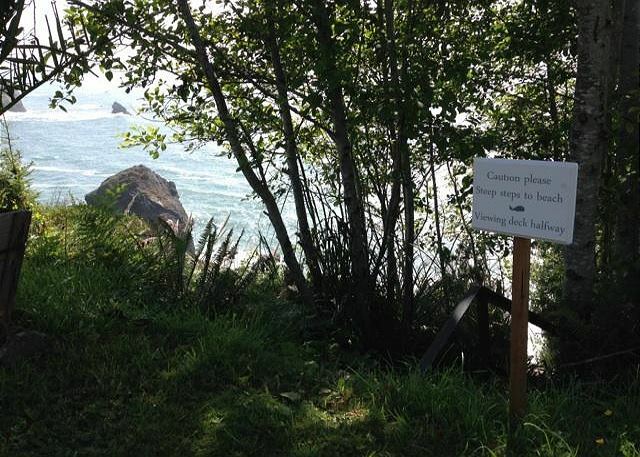 Thank you for tenting the Ocean Views Residence @ Whale Rock; we look forward to accommodating you again in the future. View is gorgeous, house is clean and comfortable. Bathroom is a little smaller than we expected. Thank you for staying at the Ocean Views Residence @ Whale Rock. Such a tranquil property to spend a few days! Thank you for choosing the Ocean Views Residence @ Whale Rock. Thank you for sharing that you had an awesome stay and I hope you will return to stay here again or at one of our many other homes with Redwood Coast Vacation Rentals. Hands down, one of the prettiest views I've ever had on vacation. The living space is spacious and plenty of room for a crowd. If you're going to spend the majority of the time outside enjoying the view, this is your spot. If you're looking for a quiet get away: head's up that you can hear EVERYTHING happening upstairs. Small kids run around early in the AM. Also, the property wasn't cleaned well. I moved the couch to access an extra outlet, was terrified by what I saw and immediately moved it back. As a renovated basement, it needs to be sprayed for spiders/bugs. For the price, I'd say you can't beat it. Thank you for reviewing the Ocean Views Residence @ Whale Rock. I can definitely agree that the view is amazing and one of the prettiest! This is definitely the place to rent for those looking to spend much time out exploring or sitting out back enjoying the view. Unfortunately, we cannot do much about the sound, but if you stay here again and it is a problem, call me right away and we will ask the guests upstairs to quiet down. I apologize for whatever was under the couch. We strive hard to hold a standard for cleaning and occasionally something does get missed. I do hope you will return to give us another chance, otherwise, we have over 100 vacation homes in the area with other, quite spectacular views, that may interest you. My family and I came up to celebrate our daughters graduation from Humboldt and the home was perfect! I was very happy with the VIEW the location and the size of the residence!!! I will definatly return!! Our family of six loved the house's unmatched views. The overlook is exactly what the photos display, an epic landscape of the cliffs and ocean. This location is the perfect middle point between Redwoods National and Humboldt State Park/Avenue of the Giants. Most days consisted of enjoying the beautiful morning sunrise, a coffee and shopping in one of surrounding towns, a hike in the afternoon, and then a relaxing drink while looking at the sunset. The only criticisms I have were - the house was very cold (to be expected in January), we could hear the people upstairs, and one of the bedrooms smelled as if a lobster had just been cooked in the room. All of these items were really insignificant and didn't take away from the natural wonder that was provided right outside the door. Overall, this was an extremely delightful trip for me and my family. This site is extraordinary and the house is the perfect place to enjoy the landscape and surrounding area. Thank you for choosing the Ocean Views Residence at Whale Rock. We do hope that you enjoyed your time here. The layout is a bit odd and ideally the home is made for the 4, with two extra guests potentially able to sleep on the futon, and as such, the bathroom definitely caters to 4. I am unsure the smell described in your review, but we will definitely look into it, so thank you for your feedback. If ever staying with us and something seems odd, please do not hesitate to call us for investigation. Again, thank you for your recent stay and we do hope you will return to visit us again, whether in this home or one of our many other homes in the area. Thouroughly enjoyed the time during our visit here. Especially loved the location of this home. Has amazing ocean views! Also found it to be very convenient to visit the various redwood parks in the area from here. Just a short drive to some beautiful hiking trails. Trillium Falls trails was a favorite with our group. The home itself is very nice. It's spacious, clean and well- maintained. Found the furniture and beds to be extremely comfortable also. The kitchen area is on the small side, not a place for any gourmet cooking, but found it to be adequate. Has a nice gas grill and patio area right outside the door available for use. Although I didn't meet or speak to the property manager personally, as there was no need to, found the customer service to be great through the communication via there mobile app. Very helpful. Also briefly ran into the owner upon arrival and she was very kind and took the time to talk with us and suggest some places to visit during our stay. Thank you so much for sharing your lovely home. Would definitly stay here again and recommend this property to others. What a great review of the Ocean Views Residience @ Whale Rock! I am so happy to hear you had such an awesome time at this home and definitely hope you will return to visit us again. Thank you for booking with Redwood Coast Vacation Rentals. This rental was absolutely beautiful! It was everything it was advertised to be and more. The house was great, the views were wonderful and we would come stay again if the opportunity comes. The patio outside was great! We spent hours out there talking, and enjoying the ocean sounds. The beds are so comfy and there was enough room for everyone to be comfortable and happy. Great place!! Delighted that the Ocean Views Residence @ Whale Rock was a great place for you. Wonderful location with such an amazing view, what a great place to be with the family! Thank you for booking with Redwood Coast Vacation Rentals and please visit again soon. 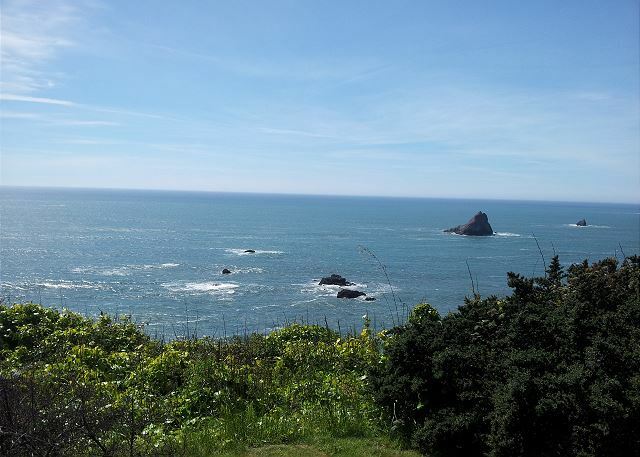 Lovely wide views of the Pacific from the property's high bluff, and overlooking a beautiful rocky cove, our stay was exceptional, and a great place to come home to after a day of hiking in nearby Prairie Creek Redwoods. Wonderfully quiet with only the ocean for sound. Bring binoculars. Definitely a lovely place to stay while on vacation. 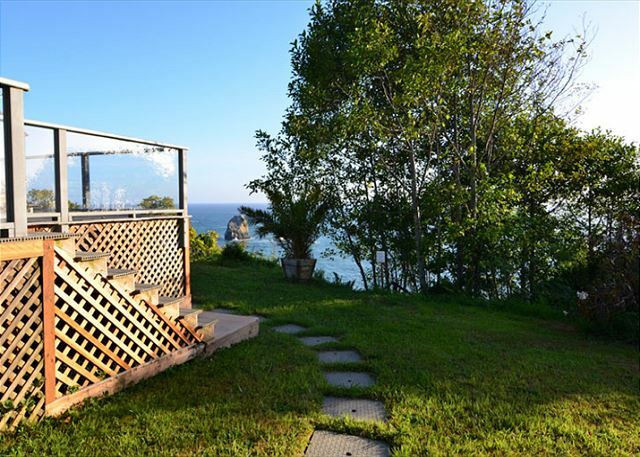 The Ocean Views Residence @ Whalerock is ideal for those wanting to sit back, relax and enjoy the view. The proximity to town and Prairie Creek Park is a plus, too. I am so pleased you enjoyed your time here. I hope you will get the opportunity to return again. Nice location , would have no problem going back. If you like privacy this could backfire depending on the other guest. Would recommend building a low fence to separate the bottom two suites. Would also be nice to park at the far left when staying in suite 2. Very clean. Thank you for your recent stay at the Ocean Views Residence @ Whale Rock. Thank you for your feedback. Often, one family or friends book the downstairs together, and we found the openness an advantage. Parking on the left would be convenient, too, but then guests would be walking right past the upstairs bedroom windows to get to their suite; therefore parking on the far right ensures privacy to the upstairs guests and does not leave a trail in the yard. We do hope you enjoyed your stay here and thank you for choosing this home for your visit. As soon as I saw the pictures of this back yard I knew we had to have a family barbeque during our visit. We were in town attending a wedding and the other guests were staying all over Trinidad and Arcata. The back yard was the perfect place to gather for an early dinner before the pub crawl that night in Arcata. We had told people about the view before their arrival, but they were still amazed at the beauty that surrounds this property. My only request would be to have cab information available in the welcome packet. The closest cab companies are in Arcata and it took us awhile to find a company that would come and get us and take us to the other side of Trinidad. Then we had trouble finding the address of the rental because it wasn't printed anywhere in the packet that we could find. Other than that, our trip was wonderful and the rental was everything we expected and more. So glad you enjoyed your time at the Ocean Views Residence; one of my favorite views from around this area, too. Thank you for the feedback regarding finding the address. I will take a look at our helpful app and see if the directions to the property need to be revamped and I think it is a great idea to provide phone numbers of the cab services. Sounds like you had a wonderful trip while up here for the wedding and I hope you will make it back again for another occasion. The house was wonderful. It was a great location and beautiful spot! The house had everything that we needed. Shhh! Keep this great place a secret. This was our favorite place to stay on a 9-day tour of California. We picked up food and wine from local markets and had a perfect dinner on the patio watching the sunset. The Ocean Views Residence Suite is a fantastic place to stay along our coast, especially for sunset viewing. 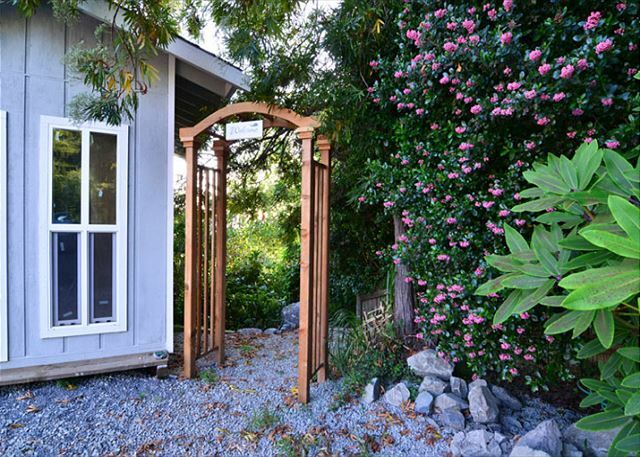 Thank you for your recent booking and for choosing to stay with Redwood Coast Vacation Rentals. Thank you for booking the Ocean Views Residence @ Whalerock. What a great place and a beautiful view. We hope you enjoyed your stay and will visit us again. 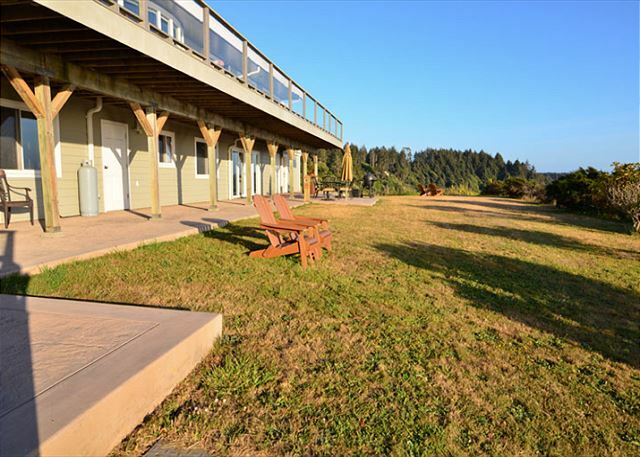 Thank you booking with Redwood Coast Vacation Rentals and for choosing the Ocean Views Residence @ Whalerock. The view is simply spectacular! The property was spotless. I would like to see a few more reading lamps in the living area(s) and the north bedroom and it might be a good idea to rearrange the couches to take advantage of the unobstructed ocean views. Oh, and did I mention the view? Thank you for your recent stay at the Ocean Views Residence @ Whale Rock. We appreciate your feedback and will look into some additional lighting, and I will pass on your suggestion for the couches. Glad you enjoyed your stay here and we hope to see you again. Excellent Location and a great view! 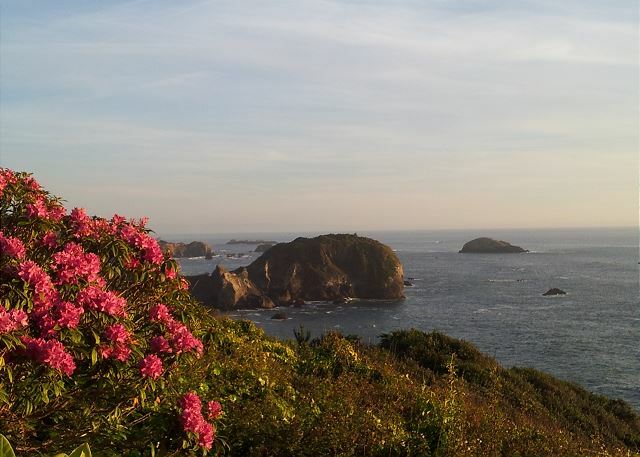 Thank you for your recent booking to the Ocean Views Residence @ Whale Rock. We hope you enjoyed your time here and I hope you will visit us again soon. Hubba hubba...exactly what was advertised. Such a lovely place. The view was breathtaking. The directions easy to follow. Seriously, we are overjoyed with our experience. We got to enjoy the Blessing of the Fleet (Thanksgiving tradition) that was incredible. Patricks Point State Park and Agate Beach were so much fun (even in late November). Redwood National Park was so much fun - we practically had about 7 miles of trail all to ourselves on Thanksgiving! What a wonderful Thanksgiving! And you were able to go to the Blessing of the Fleet; What a treat! So glad you were able to spend the holiday on our beautiful coast and that you were able to enjoy the trails during the off season. I think it makes a difference. This property is definitely such a delight, please visit us again soon! My two nights at whale Rock was fabulous, the ocean view . The experience was great. good views,quiet environment and the deck down the ladder was awesome. Whale Rock is quite the spectacular spot! The viewing deck on the bluff at the property is quite the added attraction and we are happy to hear that you enjoyed it! We look forward to your stay with us again in the future! Thanks so much for sharing your amazing house. It was perfect. We had the upstairs and down for a large group, and everyone was in awe of this place. We are glad that you took advantage of the upper and lower level of the Whalerock and rented both Whale Luxury Home and the Ocean Views Residence. It is such a convenient way to have two groups enjoy scenic coast in great comfort. Thank you for staying with us ! The location, scenery and amenities were great. Very relaxing and a great experience. I agree with you! The scenery surrounding the Ocean Views residence is spectacular. I am happy to hear that you were impressed. Please do visit us again when you return. Looked just like the pictures online! Thank you for the input on directions. We hope that you enjoyed your stay. Please do come stay with us again in one of our 70 + rentals on your next trip through town! We thoroughly enjoyed our time at Whale Rock. The scenery was stunning. We could not get enough of the sunsets over the ocean. The owner was friendly and hospitable. We enjoyed the opportunity to hike the nearby Tall Tree Grove and Fern Canyon. Thank you for allowing us to enjoy this part of the beautiful coast line. It is good to know that you enjoyed your stay at Ocean Views Residence! The home does have spectacular views and we are happy that you had the chance to experience them. Come visit us again on your next trip through town! My Uncle and Aunt and cousins stayed here. They loved it. Spectacular views. Our house is also on a bluff above the Pacific. They said our views were great, but the Whale Rock residence's views were "spectacular". Oh, well... can't please everybody. They enjoyed their stay very much. It is always a pleasure to know that our Guests are happy. Whale residence does have a spectacular view; we are glad that you had the chance to enjoy it! This was our first trip to visit the Redwoods in Northern California. We also love the beach and this rental unit exceeded all of our expectations. The views were breath taking. The walk down the steps to the ocean is not for the faint of heart, but is worth the effort if you are in good physical shape. The unit itself was roomy and provided everything we needed for our 4 night stay. The grill and outdoor table came in handy as we grilled out one evening. The sunsets were spectacular. Trinidad is a nice little town where the people are friendly with good restaurants, a grocery store, wine tasting rooms and fun little shops to brouse around. Patricks Point, a 2-3 mile drive north is a must see when staying here! We are glad that yo enjoyed your stay with us! Please do come back and visit us again! We stayed for 2 nights in May and it was a wonderful time. The rental home was in perfect condition, we had everything we needed. The location in gorgeous: view is incredible, sunset was just amazing there, and it's very close to Redwood National Park, where we spend most of the day. Cafes and grocery are just in 3 min drive. It definitely is a great place for relaxing and calm vacation. We are glad to hear that your time at Ocean Views Residence was pleasing. Please do come stay with us again on your next visit! Absolutely stunning view of the ocean! Lots of open indoor space. Lovely wood burning stove and wood was provided. My only gripes would be, only one small bathroom, and the windows were not very clean which slightly marred ones view of the ocean. Please do not go down to the beach access unless you are very surefooted and have no fear of heights. Worth the effort if you are able to. Certainly would love to go again. Thanks for having a great time! 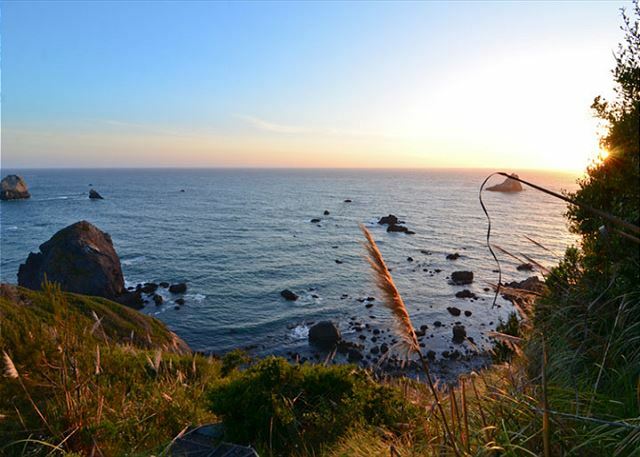 Whale Rock is a great place to enjoy Trinidad and all the local redwood forests and beaches. We do make an effort to keep the windows clean, but being so close to the ocean the elements can quickly swoop in and put on a layer of salt water. The steps to the ocean are steep, but the views are totally worth it! 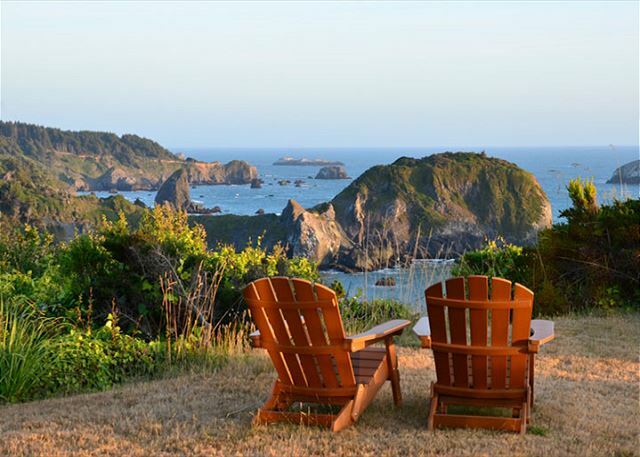 Thanks for choosing Redwood Coast Vacation Rentals with over 70 properties to choose from on the North Coast! If your trying to get the best Northern California experience then this is the place to stay. It sits in the heart of some dense forests and against a stunning coastline. This trip was absolutely unforgettable because I actually proposed to my fiancé on the viewing deck. I couldn't have asked for a more perfect spot to propose. Thank you! Fabulous! Congratulations! We would love to have the wedding here! Romantic escape from the world! My son is a football player on the HSU team and so we make trips to the area every 6-8 weeks or so. At the last minute, we decided to try something new and stay at Whale Rock. We could not have asked for a better weekend! We got to witness incredible sunsets and a sky full of stars that took our breath away! The place was large (too large for just the two of us) and so next time, we will bring more family to stay with us! We have a lot of great units for HSU parents coming to visit for the weekend and Whale Rock is one of those! Thanks for enjoying the space and we hope to see you again in 6-8 weeks at Whale Rock or one of our 60+ properties with Redwood Coast Vacation Rentals! The view from the property is fabulous and the suite itself was very large and generally comfortable. We found the bathroom to be too far from the bedroom and did not realize that there was no stove. It was clean and very well maintained. We enjoyed our stay enormously. Thank you for having a nice stay. We do indicate in our description that this unit has a kitchenette with a refrigerator, microwave, coffee maker, and toaster, and also with an outdoor BBQ for cooking. 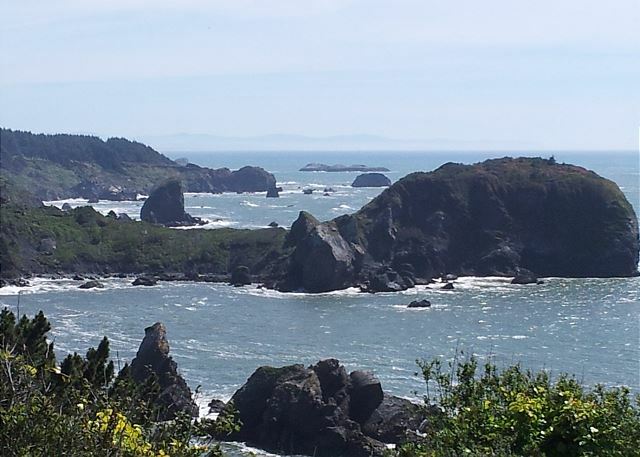 Please visit us again with Redwood Coast Vacation Rentals and try one of our 60 other properties! Thanks for enjoying the space. It really is peaceful and lovely. 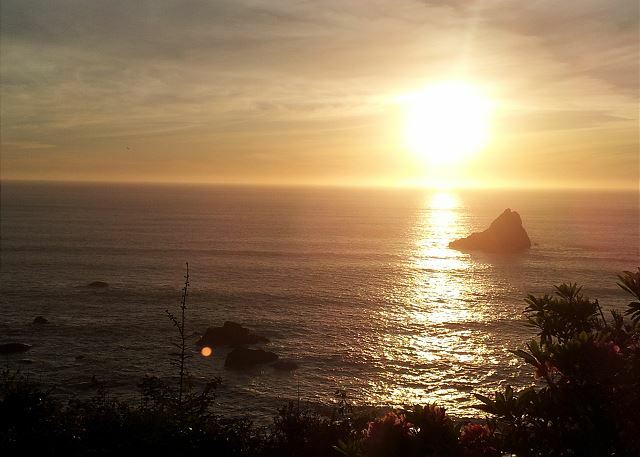 Please come again to Whale Rock with Redwood Coast Vacation Rentals! Thanks Brad! We've been getting great feedback from guests at Whale Rock, both Elegant and Ocean Views! 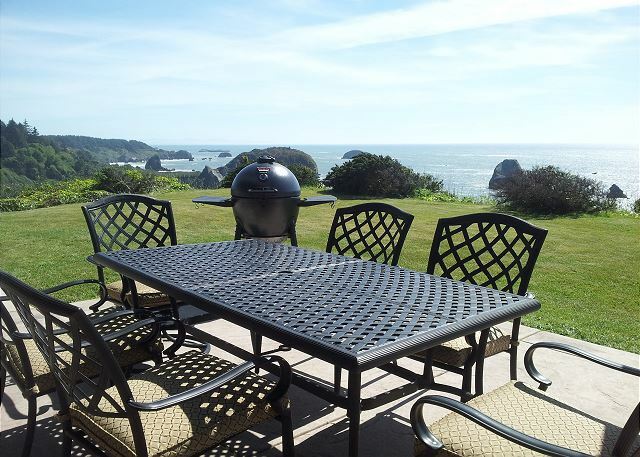 Please book again at Ocean View Residence at Whale Rock with Redwood Coast Vacation Rentals. We love it, too! Please come again and thank you for choosing Redwood Coast Vacation Rentals!